ELLA – Responsive Shopify Fashion & Apparel themes is a special store with drag and drop page builder. that will be help for make your better store. First of all, ELLA perfectly and beautifully mix and match colors, banners, blocks etc to give the whole layout a gorgeous look. ELLA has a large banner for you to showcase your hottest and newest products to immediately catch your customers’ hearts. Information blocks are nicely and neatly display for your customers to easily find the information they need. Special module to display all categories which is Shopify Advanced Mega Menu Module. you can easily manage and update all information from the Admin backend for Shopify Admin Panel. Also provide the new Ajax Layered Navigation. The Ajax Layered Navigation is an improvement of the use of Tag in order to filter your products regarding color, size, brand or price; and these tags can operate simultaneously. Yourstore is the winner of Most wanted contest from Envato. Here has huge number of different layouts and options. Premium Shopify theme YourStore comes packed with free and useful features developed to make your website creation easier. Innovative clean design, advanced functionality, UI made for humans. 22+ pre-made online store. Avaible Online Documentation and online editor. Powerfull admin panel. Few premium apps include. Support google rich snippets for better google search result. Multi language and RTL support and have many powerfull features. Everything is a Premium Multi-Stores Shopify Theme designed and developed by ThemeForest’s Elite Author. Theme is responsive, mobile compliance. W3C, HTML5, CSS3 strictly valid and compatible. The theme pack includes 65+ different creative designs ready to use. Include 29 Normal themes and 36 Sectioned themes. Everything support Oberlo App – starting a dropshipping business from Aliexpress. Pre-made Category for you: Fashion, Apparel, Eyewear, Shoes, Beauty, Cosmetics, Furniture, Baby, Kids, Garden, Watches, Sport, Jewelry, Lingerie, Electronics, High-tech, Digital, Phone, Computer, Holidays, New Year, valentine, christmas, flower, Gift, game, entertainment, spa, healthcare, yoga, foods, drinks, restaurant, dessert, bag, backpack, bicycle, pets, swimwear, supermarket, large store, groceries, aliexpress, parallax, fixed sidebar, sectioned, minimal, simple, luxury, metro, material design, instagram and much more. BStore – Responsive eCommerce Shopify Theme is a new shopify theme for fashion shop. Here has 2 defined layouts for home page to give you best selections in customization. BStore – Responsive eCommerce Shopify Theme is specially designed for any kind of online shops: clothes, digital, shoes, jewelries, bags, accessories, fashion, and many more category. It is super for fashion shop, handmade shop, accessories shop, glasses shop or many other categories. 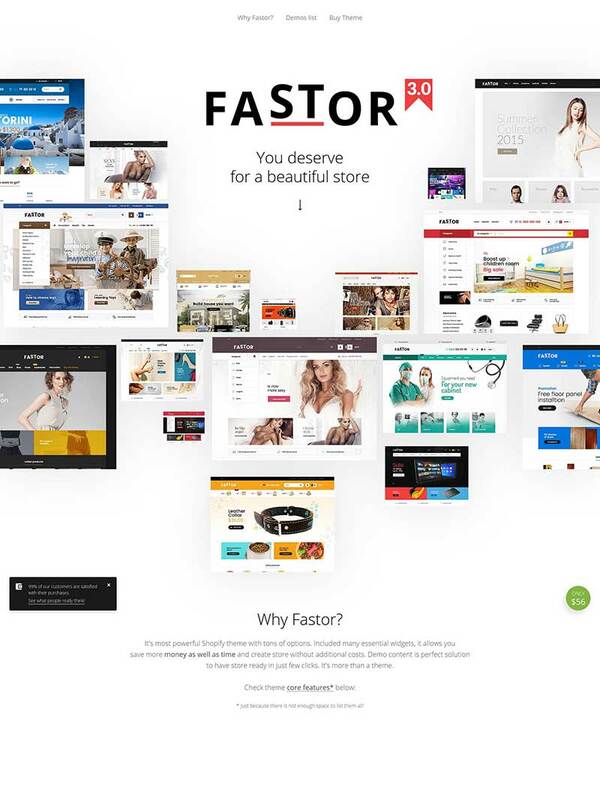 Fastor is a modern, clean and professional Shopify Theme, It is fully responsive, it looks stunning on all types of screens and devices.It is super for multipul categories. And 73+ pre-built layout on many diffrent categories. This theme make by latest shopify section technology. You can build your store by drag & Drop by use this theme.